Live Music and Refreshments will be provided! 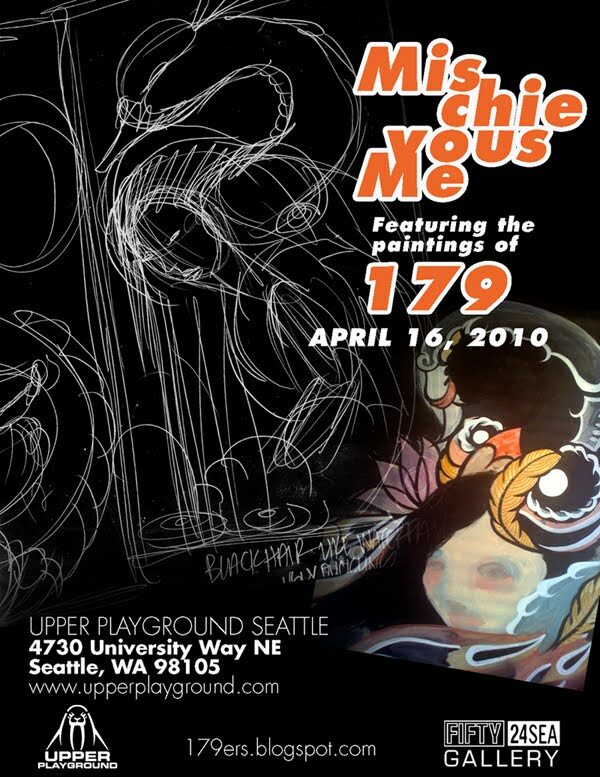 Upper Playground in Association with FIFTY 24SEA Gallery present the Opening Reception of:Â Â "Oh Mischievous Me"
As an artist she pulls from many different sources that shape the images to be painted. Folklore has been the direction she has been gravitating to. She loves old stories in which animals play tricks on people or each other. They are playful and colorful. Since these animals are surreal in nature, the paintings represent more emotion rather then the literal sense of the animal. Change can be a good thing. The important theme of this 179 show is to deal with layers. What is on the inside isn't always what is on the outside. Layers make up who we are and what we see. They can be made of many different kinds of things; animals, colors, ideas. Uncovering them can be as fun as a babushka doll or as scary as a wolf in sheep's clothing. Looks can be deceiving, so beware! The Opening Reception will be held for "Oh Mischievous Me" on April 16th from 6:00 - 10:00pm. Beverages will be provided. Recognized as a catalyst for the fusion of fashion with art, Upper Playground produces apparel lines monthly and features designs from some of the finest local and international artists and graphic designers in the world. Our hours are Monday - Saturday, 11am - 8pm, and Sunday, 12pm - 6pm. You Go Girl! Good Luck, and I wish I could be there.